Brilliant filly Sunlight can cement her place as the favourite for the Golden Slipper Stakes with another impressive win in the Group 3 $175,000 Canadian Club Magic Might Stakes (1200m) at Rosehill on Saturday. Sunlight, above, is the odds on favourite for the Magic Night Stakes at Rosehill. Photo by Steve Hart. Sunlight is unbeaten from her last four starts which includes wins in the $2m Magic Millions 2yo Classic (1200m) at the Gold Coast on January 13 and in the Group 2 $250,000 Silver Slipper Stakes (1100m) at Rosehill on February 24. 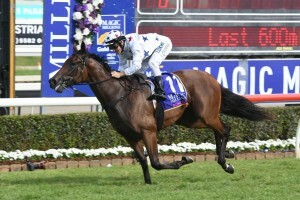 The Tony McEvoy trained filly is an odds on favourite at $1.40 to win the Magic Night Stakes and if she does will cement her spot at the top of the market order at Ladbrokes.com.au for the Group 1 $3.5m Longines Golden Slipper Stakes (1200m) at Rosehill on March 24. Sunlight is currently the $4 favourite for the Golden Slipper Stakes ahead of the $6 second pick Estijaab who she beat in the Silver Slipper Stakes while on the third line of betting at $7 is the Blue Diamond Stakes winner Written By who is expected to win the Group 3 $175,000 Café Culture + Insitu Pago Pago Stakes (1200m) at Rosehill on Saturday. Melbourne based jockey Luke Currie has been aboard Sunlight for four of her five starts and is looking forward to getting back on the Zoustar filly, replacing Tim Clark who was aboard in the Silver Slipper Stakes and made a special trip to Sydney to partner her in track work earlier in the week. “It was nice to have a spin on her. She hasn’t gone backwards, it looks like she might have thickened up a bit but I think her weight is similar,’’ Currie told the Racing New South Wales News Desk. “She’s had the perfect preparation thus far. She’s done everything that Tony (McEvoy) has asked her to do and followed his plan. “A lot of those good chances have had small hiccups in their prep whereas she hasn’t. She’s deservedly favourite, we’ll see what she does this weekend and whether she holds it. “Written By is probably having a run (in the Pago Pago) where they probably didn’t want to run and we all saw what happened to Performer. Sunlight has drawn a little awkwardly at barrier nine in the thirteen horse Magic Night Stakes field while her nearest rival in the betting, Sweet Ava at $13, has drawn nicely at barrier 5 with Brenton Avdulla in the saddle.